Choices. We all claim we want them, and we certainly want the freedom to make them ourselves, but what we don’t like to admit is that choices cause stress. Who wants more of that? Life is complicated enough; sometimes you just want things to be simple. Like, an everything-you-need-in-one-place kind of simple. That’s what you get with our 4372 Deluxe Shower Curtain Kit. We have put together a quality track and the coordinating accessory drapery hardware into one kit to save you the time and trouble of picking out the right track, brackets, carriers, etc. We know most of our customers are proud do-it-yourselfers, and we won’t take away the fun of installation for you, but let us at least help you get everything you need in one place. These shower curtain kits are a great purchase for anyone who has just moved into a new place and wants to get it up and running quickly. 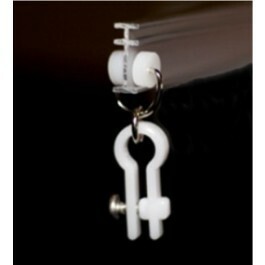 These inexpensive kits come with the curtain track, brackets, screws, end stops, and wheel carriers. Don’t let the cheap and easy aspect of the kit fool you: the track is six-foot anodized aluminum track with a satin finish that can be bent to a radius of two inches, and the shackles on the nylon wheel carriers securely clamp the holes of the shower curtain. Speaking of shower curtains, the only thing we don’t provide in our kit is the curtain. However, if you would like us to take care of that, too, that’s no problem. We have the best nylon shower curtains made by man. They are available in six colors, but if you want a more decorative option while still having the best shower curtains around, you can use the nylon curtain as a liner, and hang another shower curtain, or a standard fabric curtain of any texture, color, or design, on the outside. We would love to help you get your shower ready. Give us a call at 888-434-7444 and our sales staff will be happy to help you!